Researchers from the University of Strasbourg & CNRS (France), in collaboration with Adam Mickiewicz University in Poznań (Poland) and the University of Florence (Italy), have developed a new generation of pressure sensors based on graphene and molecular “springs”. Thanks to their highest sensitivity, these devices are ideally suited for health monitoring and point-of-care testing. These results have just been published in the journal Advanced Materials. Pressure sensors are electronic devices with the ability to translate a change in pressure into electrical signals. From a technological point of view, it is possible to imagine their use as key elements for applications in wearable bioelectronics, such as monitoring the environment of a patient or his/her state of health in a point-of-care application. Many electroactive materials have been employed for this purpose. Among these, graphene has been the most studied because of its excellent electrical conductivity, exceptional mechanical properties and large surface area. Its proven safe applicability in direct contact with the skin allows to envision applications of graphene-based sensors in the form of tattoos. To evaluate the performance of a pressure sensor, several parameters must be taken into account, such as sensitivity, response time, detection limit, linearity range, fatigue resistance, power consumption and robustness. Sensitivity is probably the most important factor for a pressure sensor. The most sensitive sensors are able to detect a pressure variation as small as a muscle movement or a sound vibration. 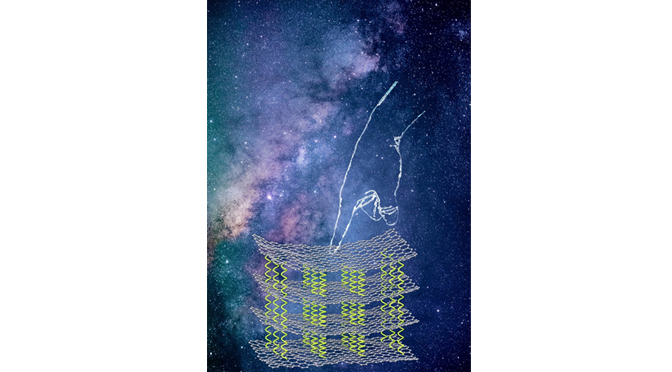 It is in this context that the researchers came up with the idea of combining a commercial two-dimensional material – graphene oxide – with reactive small molecules of different rigidity in order to produce a highly sensitive mille-feuille composite. After condensation of these species and chemical reduction of the hybrid compound formed to restore the high electrical conductivity of graphene, a conductive ink is obtained. The latter can be deposited on a substrate by spray coating, which leads to the formation of a stack of graphene sheets separated by molecular pillars. Since the mechanical properties of the multilayer structure directly depend on the compressibility of the intercalated molecules, this approach makes it possible to achieve a higher sensitivity by simply using more flexible molecular “springs” and mastering the Hooke’s law on the nanoscale. The researchers have demonstrated that by fabricating an extremely sensitive pressure sensor that can measure with a highest resolution the pulse of a patient, and have gone even further by realizing a matrix of sensors capable of acquiring additional spatial information and thus building a 3D map of the pressure exerted by an object. These results represent a breakthrough that offers multiple perspectives for health, robotics and the Internet of things, and could also benefit printed electronics. This work is part of the large-scale European project “Graphene Flagship – Core 2” (Grant Agreement No. 785219) and marks a first milestone in the subproject “ChemSens”, which aims to develop a wearable multifunctional sensor for the detection of ionic species (Na+, K+) and biomolecules (lactate, testosterone, cortisol).